Recently, on Glenn Beck's Fox News program, he had made comments claiming some Muslims are trying to conjure the Antichrist by reaking havoc on the world. For example, since Beck believes the Muslim Brotherhood were behind the mass protests in Egypt, he believes their supposed actions were intended to fulfill biblical prophecy. Glenn Beck theorized that some Muslims are trying to bring about the equivalent of the Antichrist on his Thursday show. Beck claimed that he was bringing the issue up because Iranian President Mahmoud Ahmedinejad and the leader of the Muslim Brotherhood in Egypt both believe in the Twelfth Imam--a figure in Shia Islam who Beck and his guest, author Joel Richardson, said bore a disturbing resemblance to the Biblical Antichrist. Beck and Richardson (who has written a book called "The Islamic Antichrist" that "makes the case that the biblical Antichrist is one and the same as the Quran's Muslim Mahdi"), cast the Twelfth Imam as a messiah (or Mahdi) who would bring about Judgment Day--but not before years of bloodshed and chaos which Beck told his audience people like the Iranian regime and the Muslim Brotherhood were trying to hasten. "Do you know any Christian sects who believe they can hasten the return of Jesus by creating chaos?" Beck asked Richardson. "No, they can pray," Richardson said. 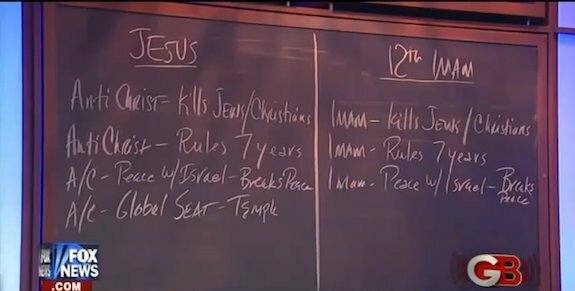 Beck then wrote a side-by-side comparison of the Twelfth Imam and the Antichrist on his chalkboard. I thought the questions between Beck and Richardson to be interesting because they illustrate a huge hypocrisy - if they believe there is nothing to do to hasten the return of Jesus, except prayer, what makes them believe there is anything apart from prayer that can postpone the return of Jesus?